I've lost my mojo in a major way. Since I started working, of course, I've had less time to knit. I've also taken up other hobbies and been going out more. So naturally, something had to give, and that thing was non-essential knitting. 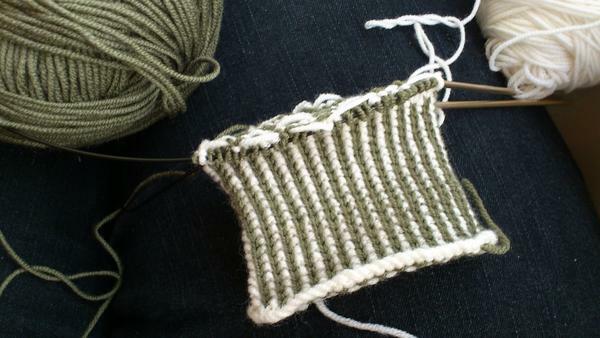 It started innocently enough: Instead of knitting on the bus, I'd read a book or use my phone. Then, instead of knitting while watching TV, I'd do my nails or just sit there (imagine! Watching telly without anything to keep your hands busy!). Eventually, it got to the point where any given week, I wouldn't do any knitting at all. My mojo was gone. And when it's gone, how ever does one get it back? I tried picking up a WIP - a pair of mitts with one glove completed - but I just got frustrated with them and my gauge had changed since I last worked on them. I tried carrying my knitting with me everywhere - but it just felt like an albatross around my neck. It turns out, in my case anyway, the kick in the bum that I needed was a deadline, a big event, and some shiny new yarn. I knit a pair of mitts for the Glasgow School of Yarn design competition - that was the start. No matter how I felt, I needed to get those mitts knit, photographed, and posted in time for the competition deadline. And I did - and I enjoyed it! Then, I cast on several new things - including a pattern I've been meaning to knit for some time now, Bombella's Bunty Mitts. Being able to cross something off my queue and develop a new technique (my colourwork is still shaky) was also a great motivator. And finally, after spending a weekend surrounded by knitters at GSoY (more on that later! ), my enthusiasm is back in leaps and bounds. I feel like a knitter again - the mojo's back, baby.